Every once in a while you come across a site where you want to slap yourself on the forehead, bellow a Homer Simpson “Doah!” and wonder why it is that no one has done this before. 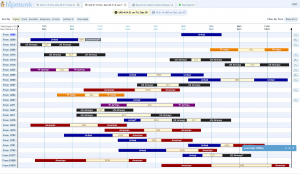 There are so many travel search engines out there but until now no one has thought to simply lay out your flight options on a nice easy to see timeline. Someone finally got around to doing something that should have been obvious but that none of us saw until now, and has done it very smartly. Move over Travelocity, Expedia and Orbitz. Goodbye Kayak and the dozens of other travel search engines out there. Hello Hipmunk.com, which made finding the right flight and hotel for our upcoming trip to New Orleans a breeze. While not a perfect travel search engine, it excels at usability. It won’t show you flights by Southwest, for example, because Southwest won’t expose their flights to any travel search engines. And it probably won’t find those island hopper or third world carriers that show up on obscure search engines like AirNinja.com. However, if your needs are modest, Hipmunk.com is the obvious travel search engine to use. Hipmunk.com has a Joe Friday “just the facts, ma’am” approach to travel searching. Keep it dirt simple. For flights, it asks where you want to leave from, where you want to go, the day of departure and a return date, if you plan to return. Smart controls minimize keystrokes and time needed to enter the information. It does not even bother to ask about the time of day that you want to leave; instead it just quickly renders a nice convenient horizontal timeline with the early morning hours on the left, late night hours on the right, and rows of horizontal bars showing various flight options along with connecting cities airport codes, if any. There is one click flight sorting depending on how you want to see results. The default sort, by “agony” is fine for most of us. The agony score is based on a number of factors including price, stopovers and flight duration. 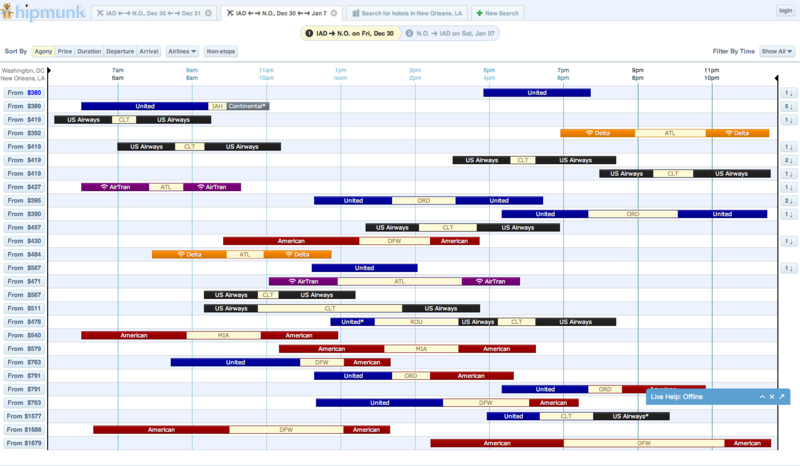 Because flights are shown in a timeline, at a glance you can see how much time you have to catch a connecting flight. A thirty-minute layover in Houston, for example, may simply be too short a time interval to chance, however much in theory it shortens your time to get to your destination. Knowing the connecting airport at a glance is also very helpful. Connecting in Atlanta is much more problematic than connecting in Charlotte, for example. If you need more details, click on the flight for a pop up dialog box with flight details. Hipmunk also does very intelligent hotel searches. In my case, I am planning a cruise out of New Orleans. I first did some research to find out where the cruise terminal is in New Orleans. Fortunately, it is close to the Latin Quarter, so we could pay a visit, however brief, to New Orleans’ most touristy district. Clicking on the hotels tab, Hipmunk assumed I was interested in a New Orleans hotel, since I chose that as my flight destination. It also assumed I wanted a reservation for the date of my arrival in New Orleans. The search was automatic. It ordered hotels based on their “ecstasy” factor, a number based on price, location and reviews. Since the map interface was Google Maps, I zoomed in on the Latin Quarter. Place your mouse over the location of interest and you get a convenient pop up box with the rating, the cost per night, a summary of tripadvisor.com ratings. You also get a small picture of the hotel. Click on the hotel and it expands to a larger pop up box where you can read recent reviews from tripadvisor.com. Tabs in the window let you see the hotel’s amenities and rating factors about the neighborhood, including the vice score and a score for food availability. To book the room, just click on the price shown and a new window opens up with the booking service offering the room for that rate. Again, it is hard to make it a simpler or faster process. In minutes I selected the hotel with the price we wanted and had booked the reservation. Hipmunk’s deficiency is that you can’t use it to find rental cars, or make train reservations, find travel bundles, or vacation packages. Perhaps those features will be added over time. Or perhaps it is best not to try. Hipmunk’s genius is doing what it does very easily and intuitively. Hipmunk is probably most useful for the frequent traveler who needs to see all travel choices quickly at a glance, needs options when there are flight delays but lacks information or time, or when they need to make a smart hotel reservation in a hurry. For vanilla travel, particularly within the United States, it is now the obvious travel site to use. You will still want to check Southwest as well, if that’s an option, because Southwest often has the lowest rates. If you have a smartphone, both Android and iOS apps are available. FYI Hipmunk DOES allow for Amtrak searches.